Like many other kingdoms in ancient times, Rome was an Empire intent on growing and expanding its borders into the unknown. Having emerged from the small territory of Lacio, the Trojan descendent Romulus initiated the rise of one of the settlements that has had the greatest impact on our history and the reality of our world to this day. Following the steps of the Greek Empire, he conquered these territories to the East, to the End of the Worlds in Western Europe. Diverse peoples and creeds existed within these territories, as it was a polytheistic empire. This whole reality changed when the social and religious movement led by Jesus of Nazareth, in combination with the existing economic conflicts within the Empire, instigated the beginning of Rome's decline. The only way to sustain the empire was to accept the growing wave of Christianity, since, as a monotheistic religion, it allowed for greater control over a population that was so large it surpassed the Caesar. Now God became the Axis of the Empire, and the Pope, a title that came from the Apostle Peter, would become its representative in the new times of Rome. Over the next thousand years, despite Rome having fallen, its fragments remained united thanks to Christianity. With the rising threat of the Arabs, led by Islam and Muhammed's conquest of the Holy Land, the Vatican began a revolt for control, known as the Inquisition. This Inquisition was headed by a Spanish-Basque who began the Crusades to the Middle East, giving rise to the Sacred Wars. This increased the power of Rome, which already ruled over Europe, Asia, and Africa...until 400 years later, when America was re-discovered. Spain, once again, would open its doors so that Rome could extend its power to the world. The Inquisition, devised by the Vatican and driven by the Iberian Peninsula, would be brought to the Americas, and came to extend itself from north to south. In every culture throughout the history of humanity people have sought out strategic places that represent a strong point of connection between the earth and the celestial world. Priests and architects built their temples on or around these sites, where people learned to listen to the Heavens, the Earth, and to its mediators. Christianity, using this same patterns of connection in combination with the wisdom of the architects and the masons, were able to erect their Cathedrals over the energetic nodes of Europe. With the Conquest of the Americas and the destruction of what were then called pagan temples, they began a conquest of the magnetic web by constructing Cathedrals on top of all the temples and nodes of America. In this way, Rome's energy of control came to extend itself through Iberia to the rest of the world, from the Rockies to the Andes and beyond, towards the colonies of the Indians and the Pacific. Europe, the continent that represents the Heart and therefore Love, used its power for conquest and control, which we recognize as the Roman domain, or the Roman Apostolic Catholic empire. And now, we have reached the times in which this flow must be changed. The builders of the Renaissance remodelled the structure of the Vatican, giving it the unique form of a gigantic key. This Key opens the gates between Heaven and Earth, and in the last two thousand years, this key has been used from control, resentment, conquest, hatred, and repression, to instill a fear of God. Today, the Love for God and Divinity is re-encountering itself within the hearts of those who were conquered, which is why we must come together to turn the Great Key, to open to this new Love. If every point of the world, especially within the Americas, is connected to the Vatican, this means that the Network has been instilling these negative messages over these territories and to the greater part of the world. Today the world is changing, but to achieve this great transformation we need to send this new frequency in the inverse direction: from the Americas, turning our intention toward Love, giving our love to Iberia, and from there, through our Love, push this frequency along the Spiral toward Rome, to turn the key of the Vatican from North to South. Thus, we will be opening the gates of Heaven on Earth through our Love. It will be a long journey to change the reality of the entire world, but we can start by expanding our awareness and activating the frequency of these power places. Even a few people are enough to change the waves of frequency that connect the world. On the 15th of June at 19 hrs, we will plant our intention and our seed in the Obelisk of St. Peter's Square, so that together, connected from every Cathedral in America and Iberia, we can release our bonds of Love and Gratitude toward the Vatican, transforming its frequency into Love. This is a small, yet great step toward the great transformation of the future. Only through our Unconditional Love can we liberate ourselves from the bonds that we ourselves created in the History of the past. We do not ask for forgiveness, nor do we give forgiveness; we only offer gratitude and love, uniting with the great network, opening the gates of Heaven within every heart and within the Heart of the Earth. On June 15th, 2014, we are called to perform an important task that we must sustain together to open the doors to the frequency that will be entering in the coming years. The Great TASK will be for Sunday, June 15th, 2014 at 7pm Italian time, when all of us must re-member and connect with the network that constitutes our society, to turn the Key that will open the Gates of Heaven on Earth. On this day, a group of people will be gathering at St. Peter's Square at the Vatican to set our intention to shift the frequency and mirror Rome's authority over the world, in this way turning it into Love. WHERE: On each energetic node of the Americas, a Cathedral was built as an anchor of the Vatican (Rome). These were imposed through colonialism and the Inquisition. 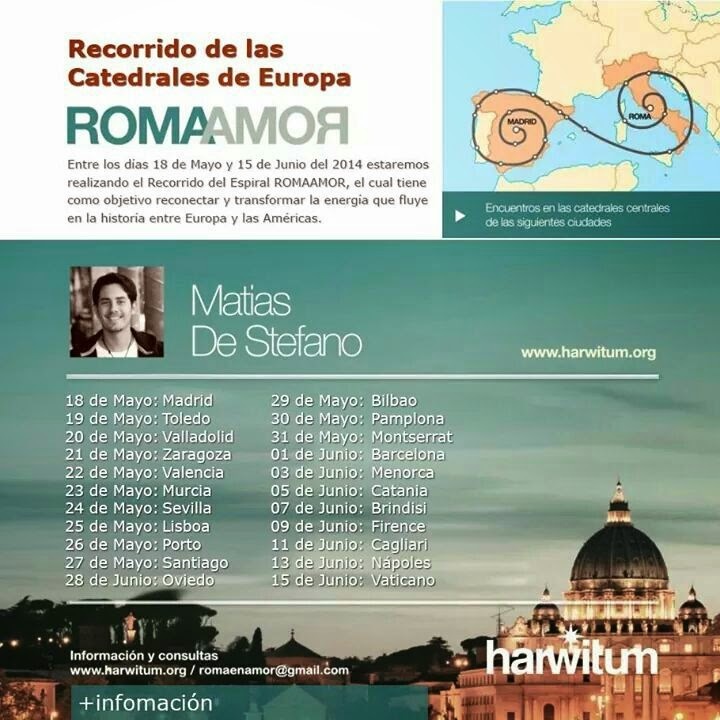 On this day our role will be to mobilize all the Harwitum Groups in Europe and the 3 Americas to join in an activation of sound and love in front of, or inside the oldest and most important cathedrals in your town or city. HOW: Make a circle inside or outside your Cathedral, asking permission from each place in the way you feel called to, using instruments, your voice, meditations, and any other tool that resonates within you. Connect with the power node of the Earth under the Cathedral and join it with the centre of the Cathedral and the magnetic force above the Cathedral, so that all three points pulse with frequency, then visualize the spiral that connects them to the Magnetic Web and drive all this Love toward Rome, where a group of people will be receiving this power to turn the Key of the Vatican. If you are not part of a Harwitum group, join the group nearest you on Facebook, or create one to coordinate a meditation in your city. You can see the Harwitum groups in The Network section of our website. Today, the Andes mountains that extend from Venezuela to Chile-Argentina, hold the activation of the Planetary Kundalini and thus the frequency that activates the Human Potential and DNA of our awakening. Río de Janeiro is the Gate of the Andes to the World, as the point where the 11 dense dimensions and the 11 subtle dimensions come together in unity. These 22 dimensions and races will unite under the frequency of the 2014 World Cup, for which Río de Janeiro will be our energetic catapult towards Europe and the rest of the World, as everyone's attention and energy will be focused on this event during this time. WHERE: From all the Cathedrals of the Andes, pulse the energy of their respective nodes to Rome by sending this high frequency Love to Río de Janeiro, where the Harwitum groups of the region will receive this Love from the Andes and catapult it, with all the power of the Heart, toward Rome and the rest of the world, which will have their hearts set on a sport that connects the majority of humanity. HOW: For those who will be connecting from the Andean cathedrals, in the way you feel called to, extract the codes from the mountains and South American regions that you are in and send these DNA codes along the network to the city and state of Río de Janeiro. For those who are in Río, open your hearts to receive these frequencies and pulse them toward Portugal, Spain, and Rome. This is the GREAT ASSIGNMENT of 2014: Opening this gate of Love will allow us to birth the foundations of the new frequency. Loving our history and transcending it through integration is the key for the transformation of the world. Frequency is driven by the conscious will of those who know that the world is transforming, and that humans are primordial agents of this change. By becoming conscious activators of this frequential change, we enable their waves to alter the magnetism that creates the molecules that form our DNA in which the potential of our being lies. Through its activation, we are led to perform the actions that will change our reality. Sound and its frequency waves create Light amidst the Darkness, which generates the Form that leads to action and transformation, which is synonymous with what humans call Love. Create Harwitum Facebook Groups in your town or city and send a request to Movimiento Harwitum so we can add you to our official map of the Network on the Harwitum site. Bring together everyone from your region or city who is interested and add them to your Facebook groups so that everyone can be informed about our progress and receive the updates of each group. Please do not name more than 3 Administrators! If you have contacts, please help us bring this Journey to Pope Francis' awareness. If you are in contact with teachers, guides, or light workers who move many people in consciousness on the physical plane, we ask that you share this information with them so they may join this frequential cause, (...such as proposing that they convoke a Meditation for returning Rome to Love). Let's hold the intention of working in Synchrony with all the groups of Harwitum so our activations create a pulse in the change of frequency, like waves in the sea. Organize gatherings with your local group every 7 days to connect with the 7 chakras of your city or regions, and in this way activate the frequency of your area. Sunday April 13, 2014: alignment and mediation to connect with Universal Spirit and the Centre of the Earth through Unconditional Love. Connection to London via the etheric wifi! Sunday April 27, 2014: perform a meditation gathering, activation, or talk somewhere to unify the frequency of our own chakras with those on the map of our area, preparing ourselves to align with the weekly activations every Sunday until we gather in Rome in June. Sunday May 18, 2014: we will meet to work in alignment with the Solar Plexus Chakra of your area (hold a meditation gathering, an activation, or talk in this place to move its frequency, using the tools that you have and you resonate with to achieve it.) Connection with Madrid via the etheric wifi! Sunday June 1, 2014: we will come together to work in synchrony with the Throat Chakra of your area (hold a meditation, activation, or talk in this place to move its frequency, using the tools that you resonate with). Sunday June 8, 2014: we will come together to work in synchrony with the Third Eye Chakra of your area (hold a meditation, activation or talk in this place to move its frequency, using the tools that you resonate with). Saturday June 15, 2014: we will come together to work in synchrony with the Crown Chakra of your area (hold a meditation, activation, or talk in this place to move its frequency, using the tools that you resonate with). CONNECTION WITH ROME AND THE VATICAN! Sunday June 15, 2014: meet with your group to activate in synchrony with the Crown Chakra of your area, emanating through music or any tools of consciousness and energy that you have at your disposal, toward the Vatican. This meeting should be held at the Crown Chakra of your town or city, that is, at the oldest or most important Cathedral which represents the axis of your area. If you are in a town or city along the Andes, from Caracas (Venezuela), to Ushuaia (Argentina), send your energy and intention to Rome with Love through the Heart, which is Río de Janeiro (Brazil). 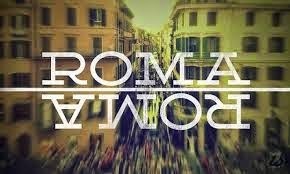 If you are in any other part of the world, send this frequency to Rome directly from your Heart. If you are in Río de Janeiro or any part of southern Brazil, receive the the energy of love from the Andes and, with all the strength of the region, propel it forward to Rome. According to the messages I received in Rome in the days prior to beginning the spiral, it would be important to bring the intention of the Runes into the cities we would visit in the Spiral as these are symbols born over five thousand years ago among the Etruscan peoples of Italy. Today they are codes that allow us to activate and turn the key to open the gates between Heaven and Earth. Each rune corresponds to a city in the Spiral: there are 24 in total. In each activation we will work with their intentions to activate the codes that will open the frequential gates to us in Italy. Assisi – 24 – Othel – Respect = honouring the ancestors, inheritance of the mission from our roots. Cathedrals are the power centres that amplify the energy and consciousness of a region, since they are the Pyramids of our era and civilization.